After breakfast, we followed the trail from our hotel to the Falls for one last glance, and were lost in a bittersweet moment. It was two minutes away – RIGHT ACROSS OUR ROOMS that overlooked the gardens! It took us 15 minutes to get there the day before by car, which was totally unnecessary and an extra expense. We immediately suppressed our anger/confusion as soon as we felt the power of the water. It looked different. I bet you it looks different every day. We let go of the sh*tty feeling of being cheated, and appreciated every single moment: we were in Livingstone, by the Falls, in Zambia, fresh air, blue skies. I couldn’t have asked for more. Livingstone to Lusaka: 510km (7 hours). 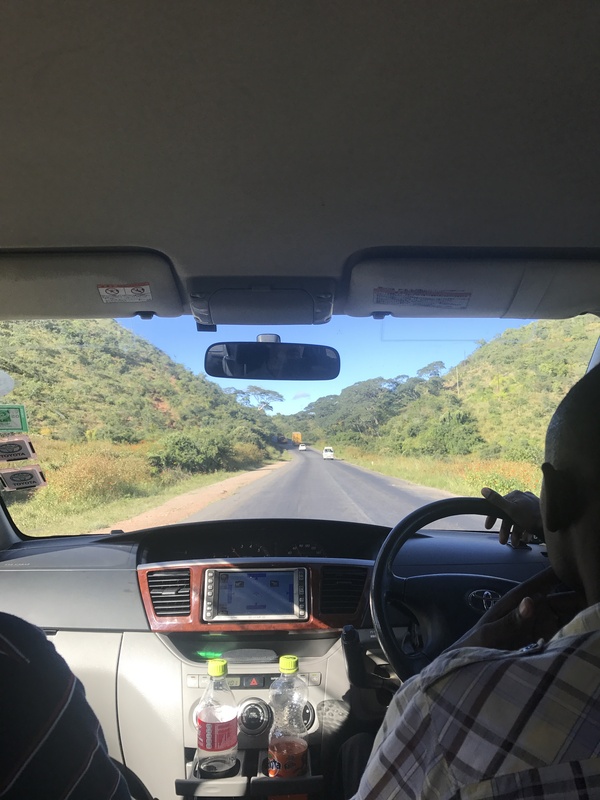 According to Google Maps, it’s a straightforward drive on the ONE HIGHWAY that cuts through Zambia – expected arrival 7 hours. Our ride was scheduled at 9:30am. The driver showed up 10minutes late and had the nerve to tell me that he was waiting for us in the lobby for the past 10 minutes when I saw him pull in a second ago. As he pulled in, I thought to myself, ‘Oh please, I hope this piece of sh** is not our ride’. We were greeted sloppily by two guys, Ow and Mow for short. We paid USD850 total for a ridiculous 5 seater and a driver (Ow) who lethargically said ‘it’s a long drive’ while he helped himself to a coke from the cooler in the trunk. Duh, that’s the whole point. All three of us were cramped in the back seat. Ow and Mow babbled non stop. They didn’t engage in much conversation with us, and when they did, their cliche attempt was awful; ‘do you like the Falls?’ Ow drove recklessly with one arm while drinking his coke with the other. He fidgeted the entire time, touching his face, arms and head, (my biggest pet peeve) and unceasingly swerved to the right on a two lane road. We were kept on our toes, excessive palm sweat. Two hours later, Ow pulled over and Mow was in charge of driving. He drove acceptably, with two hands, so our heart rates went back to normal. Whenever we asked, ‘are we there yet?’ or ‘where are we?’ they were ambivalent and responded with ‘it’s the way’. Despite all this, we were captivated by the lushness of nature and clear blue skies. When we occasionally drove into villages, we observed daily life; women dressed in patterned clothes setting up their daily fresh produce on the side of the road and a ton of used clothes (perhaps donations from 1st world countries) for sale. All around, people were busy doing things, the crowds were buzzing. Around 6 hours into the journey, we asked, the response ’50km left to the airport’. Skies were blue, roads were clear, it was still pleasant until half hour later, the driver took a detour (by mistake) and drove us straight into the LUSAKA RUSH HOUR TRAFFIC (Cairo Road), supplemented with phone calls every two seconds to this one guy, the equivalent of a google map guide. Whenever that guy said something, they turned left or right or stopped. It was clear, we were lost. They were agitated as f***, while we were slowly bubbling anger. It was grey and polluted while cars, people and animals were fighting to reach their destinations. 7 hours into the journey and in the crazy rush hour, Mow, the ‘supposed’ good driver passed a red light, a delight to the police that caught him and forced us to stop. After a 10 minutes interrogation in English, while I wondered why Mow and Ow spoke in a foreign language when most Zambians speak English to each other, during the many hours with them. The police asked for a driver’s license and wanted to us to go to the police station to resolve the matter. At this point, I almost shrieked that we were tourists and had a flight to catch in 3 hours, but my brother stopped me. My cousin was fuming. The police didn’t care we were foreigners and the situation got worse when they tried to bribe the police. Meanwhile, we learned that the drivers were not even Zambians. They were from Zimbabwe. Mow got out of the car to pull out his drivers license from his backpack in the trunk. He was taken away away for a while. OW had not a clue when he would be back or what would happen next, in response to our incessant questions. How’s that for a relaxing drive to the airport? It’s not like we could have gotten out of the car and hailed another ride to the airport. Lusaka traffic was a NIGHTMARE, barraged by toots and beeps. Cabs were out of sight and people were all over the place. Finally, Mow was back and our lives were threatened once again when Ow took over the wheels. Full on bickering between the two while they were on the phone with the ‘google map guide’ who instructed them to take a turn into another main highway where traffic had come to a standstill and people were driving in all directions to get away. They didn’t give us clear answers as to where we were and how much longer we had left. We heavily huffed and puffed and expressed how angry we were. Also, our eyes were stuck on the fuel gauge that indicated an almost empty tank, escalating our stress levels even further. In the midst of the pandemonium, Mow, the one giving Ow directions from the google guide guy, wanted to use the bathroom. So, he left the car without his phone. By then traffic moved, Ow didn’t wait and drove us towards where he thought the airport was – STOPPING EVERY CAR AND PEDESTRIAN TO ASK FOR DIRECTIONS TO THE AIRPORT. Unfortunately no clear road signs in Lusaka. He sped on the highway and BY CHANCE I saw a sign to the airport and asked him to take the left. Otherwise, we would have been driving straight to the unknown until we ran out of fuel. It got dark and we were not just on our toes, but ready for a full blown panic attack as he drove recklessly, doing take overs on a two lane road. We spent a total of 8.5 hours in the car, Ow said nothing when he dropped us off. HAHAH That’s right !! Good to hear from you! Love the detailed explanation of what you went through! Made me live the moment as if I was with you in the car… phiew! Glad to have you back.. safely!!! !